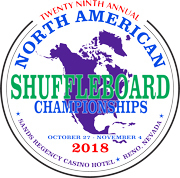 The dates for the 29th Annual North American Shuffleboard Championships™ are October 27th through November 4th, 2018. The Shuffleboard Federation and the Sands Regency Casino Hotel invite you to Reno, Nevada for nine days of action, which includes 13 events for four skill levels on 32 World Class Shuffleboard Tables. Important: When registering, please include the following information in the comments field: Your Player ID #, which can be found here: 2018 Bowers Ratings, and the name of your partner, if you have one for Doubles. Also, One Player Per Registration, Please!! !